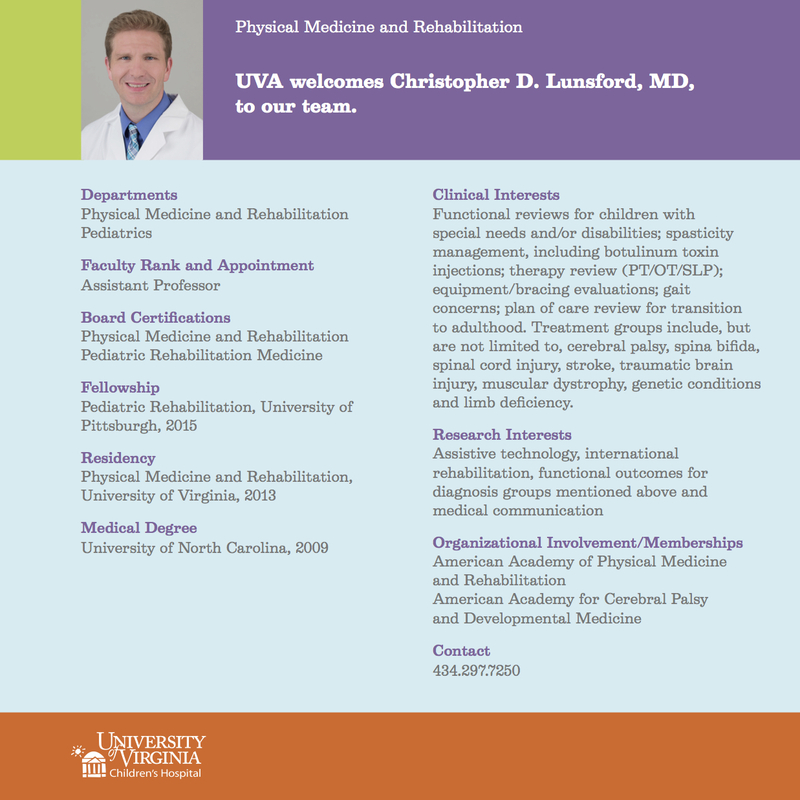 Disability@UVA – Discussing disabilities and how people live, work, and thrive with them. This past summer, I was blessed with the opportunity to take over as the new Disability Studies Initiative Graduate coordinator at the University of Virginia. In my first few months on the job, I have been impressed and moved by the high level of active and empowered citizenship flourishing throughout the U. Va. Community. From the interdisciplinary and administrative Disability and Advocacy Action Committee to student organizations, classes, and clubs, people at U. Va. Are seriously driven in working towards creating a more equitable and inclusive college campus. For this month’s blog post, I thought we would do something a little different. Recently, I was given the chance to sit down with four able-bodied, but disability-allied students to discuss their experience in working with the disabled community. I recorded that conversation and included it here. In the style of the podcast “Beautiful Stories with Anonymous People,” what follows is a roughly 30-minute, casual conversation recorded in both audio and textual formats, where we discuss such topics as activism at U. Va., specific project goals, community demographics, and the experience of being an able-bodied ally to the disabled community. For the sake of anonymity, I have changed each student’s name. Any editing done in the transcript is for the purpose of clarity only. Please keep the conversation alive. Interviewer: I am here today with four students at the University of Virginia, Mark, Tori, Michelle, and Andi. Mark, Tori, and Michelle are all a part of the Batten Class “From Inequality to Action,” where they are planning projects that focus on fostering greater levels of accessibility for disabled people on U. Va.’s campus. Andi is a member of the Student Council Buildings and Grounds Committee and is here to discuss her specific goal of making one of the rooms on the Historic Lawn compliant with the Americans with Disabilities Act. All four students are able-bodied, but disability allied people. Why don’t we begin our conversation by discussing your specific projects? Mark: This is only a semester-long class, and so some of the potential solutions that we are seeking in regards to this problem of accessibility at U. Va. are going to be sort of long-term—more time and greater financial investments. Because the ultimate goal of this class is, by the end of the semester, to have some sort of actionable solution to implement. So, we are trying to balance being able to produce something, finding a solution that is feasible that we can complete in that time frame that is actually helpful to the disability community, while still having that sort of long view of “what sort of lasting impact could we potentially have on the University?” Also, could we partner with other allies, past just this semester? Interviewer: Alright, so you are thinking longevity—how to keep this going and having like specific, deliverables, a goal to hit. Is that how both of you understand? Tori: Yes, I went and talked to my professor about this after the DAAC meeting on Friday. Basically, I asked, whether this [project] could be something where we lay the framework for a much more long-term project. We definitely don’t want it to be the case where we are just sort of coming and going out and not seeing any kind of result, especially because we’re allies and not actually a part of the disabled community, and so we don’t want to just come in and then not stay to feel the after-effects of whatever we do. We don’t want to do a half-done job that doesn’t benefit anyone. Interviewer: And you mentioned Andi, at the meeting, that you had a goal of—well why don’t you explain to me what your goal was exactly. Andi: I got inspired by my TA last semester, and I had this idea—well, I was kind of frustrated with the University last year for a couple of reasons. I was a first year, so, I was just finding my ground, and I was like, “What can I do to make a change?” And then I saw the email about applying to student council committees, and I said, “This is something I want to do,” and I applied to one of them and, my committee head said that we should have a personal project. So, I interviewed with this specific personal project, where I was like, “I want to make a lawn room ADA compliant—at least one, while I am here—so, it has kind of just worked out really well, and I’ve taken that [the Lawn Room project] as my personal project within my committee. But it’s definitely something that I’ll be able to work on, since I am only a second year, the next two and a half years that I am here. But yeah, my end goal is to make at least one room ADA compliant, because we should want to be able to say, “We have this room ready for you,” not, “oh, we can change for you.” It’s just such an honor to live on the Lawn, and it blew my mind that doing so wasn’t accessible yet, and it wasn’t even accessible for some disabled people to go onto the Lawn until this year. Tori: An interesting thing that we found was this: because the university tries to fulfill the requirements of the ADA, and stuff like that, in most respects, I mean besides the Lawn room—and there are other ongoing projects—and that’s [the Lawn Room] ongoing. There are people working on that. We talked to a few people and they mentioned how much behind the scenes work is going on, especially with the physical aspects. So, I think one of the things that struck me a lot was that it [creating change] is about mindset, and students—allied students, or just students in general—to be aware of these things [inequity in accessibility]. Because, if it [inequity] is not something that you think about each day, then—we didn’t think of this kind of stuff before we started this project, and now it’s something that we consider more. With the CIO checklist, I think that’s a way for organizations to fill the gap between the physical barriers and more abstract decisions being made on campus regarding the disability community. Interviewer: I have just a few questions for you then. And the first has to do with engagement. I came from an Undergraduate career at a university where the student body was really not very engaged— even socially. So maybe, I could just get each of your perspectives on what civic life is like as a student at U. Va. Because I know that U. Va. really pushes empowered citizenship. Do you feel as though that is something that actually occurs here? Andi: I guess for me, U. Va. lays out all of these formats for becoming empowered citizens, and pushes us to do all these cool things, like stand up for ourselves and make changes for ourselves, and if you’re the type of person to do that, you have all the room here to do that, and it’s so awesome. But, if you’re the type of person to not care about that, then that’s it, you’re never going to experience that part of university life. But I think that what’s cool about U. Va. is that there are a lot of people who do care about making positive changes and improving the University, and the rest of the world. I have a lot of friends who are “pre-commerce,” they want to be in the commerce school [McIntire School of Commerce], and that doesn’t necessarily have that same explicit humanities “trying to change the world focus.” But, all of my pre-com. friends, they go out and civically engage—they try to get people to vote. So, there are outlets for everyone to use their voice. It’s just whether or not they want to. I guess, for me, I don’t necessarily notice this engagement every day. I’m not explicitly saying that “Oh that’s a student making a difference,” or “Oh, that’s how it should be,” because people do get engaged here, and that’s what the University has done. Mark: I think that I would agree. The U. Va. stereotype is like a “rich, white kid,” and I think there obviously is some validity to that, but I would agree with your point [Andi] that whether it’s obvious or not, the idea of “student self-governance” is a real thing if you want it to be. I think we need to be cautious though: at some points, there’s almost a fallacy of student self-governance, in which there are limits on what students can actually accomplish, so that the University, maybe will say, “Oh, look at how empowered our students are!” When, in reality, they are still putting restraints on how much students can actually get done. I don’t know, you [Michelle] are in student council, maybe you can talk a little more about how successful you have been. Tori: Yeah, I guess it’s complicated. And I have to preface this remark by saying I can’t speak from my position—or from my role on student council. But, I have mixed feelings about it [student self-governance], I suppose, but I will back what the other two [Michelle and Mark] have said. I think that the student council does a lot of really cool stuff. I think we are trusted within what is reasonable. Because U. Va. is such a large school, and there is so much to run and manage, there are a lot of things you have to do to get a policy in place—and generally, I have always felt “heard” here, [I have always felt] responded to. But I know there are definitely inequities in the University and I am obviously speaking from a place of privilege. Michelle: I think it’s interesting— a recent example [of some of the inequity going on at the University] is the proposal that was set out by the Latino Student Youth Work Group. And, one of their requests was asking for guides to be able to get tours in different languages. So, the guide service wanted to support that but they you know, can’t be political and, there’s this huge internal debate—-like she [Tori] just said, I can’t be speaking from any official position—so there are limitations, and I think that reflects how the University is run. We always want to look like we are doing the right thing. Sometimes, that makes them reactive [the University] but sometimes they also want to quiet things down a little bit. There are a couple of examples that I know of, professors doing things inappropriately, and the University wants to quiet that sort of thing down as much as possible. Because, we [as a University] want to look good, and sell ourselves. So, I think that’s definitely been an issue. But I also think that because the status quo here is pretty comfortable for a lot of people, you don’t see as much allied student activism—it really falls on the students in the tough positions. So, I think certain students do speak out, but only as a result of their situations becoming, perhaps, unbearable for any longer. Interviewer: On that note then, how do you see that same sort of dynamic playing out with the Disability Community here? Has there been more success with getting voices heard in that community? Tori: I have been surprised by the extent of the resources here. Again, I’m not actually a part of the community, but from a perspective like the DAAC, and different administrators who have been more than happy to talk to us about our projects and stuff like that—I have been surprised by the interest…it sounds to us like the most pushback comes from, actually, alumni. We mentioned this at the DAAC meeting, but when we talked to an important contact about accessibility to the Lawn, we were told that when they started to build the ramps on the lawn, there was some pushback from alumni. Interviewer: From much older alumni? Tori: But it was about the aesthetic of the Lawn. So, I think that the University is constantly trying to cater to those two sides [history and progress], and I think sometimes it might feel like they [The University] are not as progressive as they could be because of this [balancing of history and progress]. But, I think that the image that the consciousness to the University’s [historical aesthetic] image could be leveraged for this kind of a project [for ADA compliance on the Lawn] because, you know, the University wants to be seen as a school that’s accepting of minority populations, an aesthetic issue in and of itself. Andi: And U. Va. is a public university, so a lot of the extra funding that the University utilizes for other things, is coming from alumni. And, I think this has an effect on how much the University is willing to push alumni’s buttons. I think at the higher levels [of administration] it gets kind of political and even with my project [for ADA Lawn compliance] people have said to me “you need to frame this politically, or you’re not going to get anything done.” I have had multiple people tell that to me. Interviewer: So, they are telling you up front that you have to play the political game? Mark: I would just add a little, in terms of how U. Va. prefers things to be a little bit quieter…and having very obvious renovations happening on the Lawn, especially for big events like Ryan’s inauguration, is the opposite of having things quiet. So, I think the disability community, in terms of other forms of inequity that are more in your face, like race, or socioeconomic status, or gender—a lot of people just don’t think about the disability community at all, and it then becomes something you have to approach from a different angle than maybe you would trying to address other forms of corruption or inequity. There’s an extra push you have to make to get people to really care about it [disabilities]. Interviewer: [Tori and Mark], you mentioned this balancing between preserving the history and, also, progress. Would you say that that’s a tension you see a lot here at the University? Interviewer: I see. So, you see the administration—perhaps the grounds crew, or the historic preservation, as not so much halting progress, but more like, “it has to be done the right way,” which puts up a lot of red tapes. Mark: One thing that Brian Hogg said, was that, when it came to implementing the Lawn ramps, they had originally devised this idea 15 years ago, but for the longest time, they didn’t make any progress on it, because—and this is how he phrased it—they just didn’t believe it was possible that they could get it done. And that relates to what you [Michelle] were saying. This is not a situation where maybe they [the administration] are like “No. We are sticking 100% with the history of this building.” But, maybe there’s that reluctance or lack of a full motivation or effort to come up with a creative solution. So, it’s not a full pushing against progress. Progress is much more deliberate. Interviewer: So, what does that do then, for people in your position: allies, or people in a class that’s perhaps only a semester long. This is sort of the issue you all brought to me at the beginning. If progress is going to happen slowly, how do you keep students actively engaged—allies actively engaged—in helping. Mark: I think there are two ways to look at this issue. There’s one, which is just physical infrastructure and how we are going to change it through construction or renovation. And then, the other side of this is just about changing people’s mindset regarding disability and accommodation—you know, making it a “muscle-memory” sort of thing, of like “I’m always going to consider the potential accommodation that we should have events when planning stuff.” And maybe that’s sort of the side that, within the semester, we have targeted more. While, in the long view, maybe we look towards supporting [Andi] in her quest to get these physical renovations done: it’s [about] attacking the issue from two different sides. I got an email back from somebody and they were like “oh we thought about a Greek life member needing accessibility to things, but we never thought specifically about people wanting to come [but not feeling represented adequately in the selection of venues] to events that we put on because a lot of events do happen in this realm [with limited access].” So, I think advocacy and raising awareness goes a long way in making our projects continue because getting as many people to think about these issues as possible will lead to changes in other areas, where it’s not just us saying “you [clubs] need to change this,” they need to work on this in their own clubs. Mark: Yes, and I think this [sort of approach] will broaden your collation in terms of finding supporters to then back the more long-term investments, and raise motivation to keep up a sort of sustained pressure on the University towards making a change. Michelle: And it doesn’t even have to be pressure on the University, it can just be people and clubs putting pressure on themselves. Because that’s the thing: the gray area between the University and what they have done, and then students, stuff we control—that gray area where the University doesn’t have control, it’s on us to [take control]. Interviewer: There are two avenues of questioning that I wanted to address; let me see if I can sort of tie them together. The first thing that I am thinking about: As able-bodied people, what do you see as the most pressing issue for disability advocacy at the University? I think for you [Andi], it’s the Lawn rooms perhaps? But, maybe it’s accessibility more broadly? Would you say that’s true? That accessibility as a general concept is the most pressing issue? Andi: I would say that inclusivity— getting everyone into our student body—because like, Mark said, U. Va. is seen to be, white rich kids, and I think, now more than ever, there’s a really big push for all levels of socioeconomic status, and race, and all levels of ability to be included into our community. For me, the Lawn is a symbol of that because that is the center of our University. That is the first thing you saw when you go on a tour—they take you to the Lawn. If a student who is not able-bodied wants to tour our university, up until now, they couldn’t even go up onto the Lawn with the same tour group that they would have gone with before—it would have to be a different experience—and that to me doesn’t sound like inclusivity. I understand that there are some challenges that people will always have to face, but I guess the biggest issue is inclusivity, and accessibility is a huge part of that inclusivity. 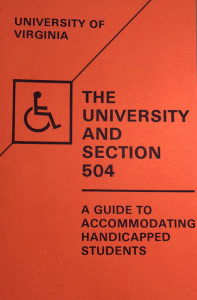 Because people with certain disabilities can’t live on the Lawn, they are not included in that honor of the student body. Mark: Yeah, I guess [the biggest issue is] accessibility in terms of being able to access everything that U. VA. has to offer. Whether that’s simply being able to study in a certain academic space that you wouldn’t be able to otherwise unless an accommodation was made, or something like living on the Lawn. Your ability shouldn’t define your U. Va. experience in any way; you [as a disabled person] should have the same access to resources to opportunities that any [able-bodied] student would, that’s how I view it. Tori: I guess [the biggest issue is] just making other people keep it [disability] more in mind. 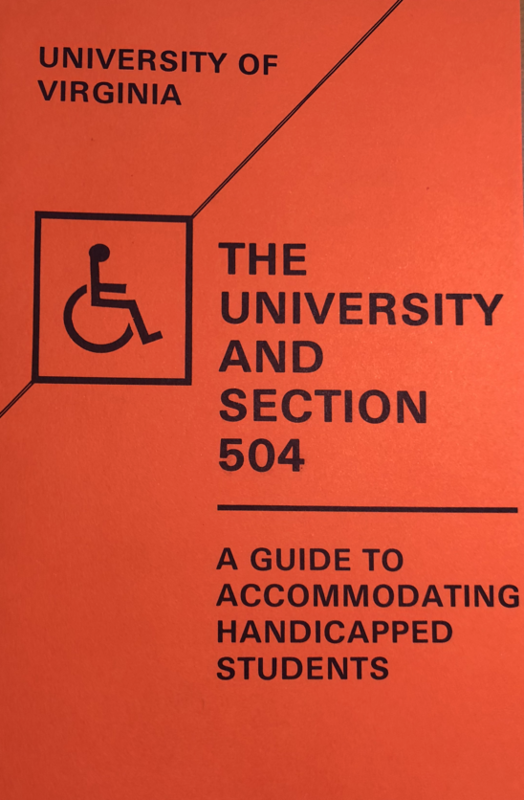 I think that the University has really good resources for students who are part of the disabled community—they could be doing more to create more awareness within the student body, generally. Interviewer: So, increasing visibility as a whole, at the University? Michelle: Yeah, I agree with everyone else. Personally, I feel like, if it [a service, program, tool, space, etc.] doesn’t have a use for everybody in a University, then I don’t see the value of it. If it’s just a Lawn that Jefferson built—I don’t like him very much anyway—that doesn’t really have a [use]-value. And if we are creating this hierarchy where those people who live there [on the Lawn] are supposedly the best of the best, and a certain portion of the population can’t even access it or live there, then I don’t see any value in that hierarchy, and I don’t see any value in that physical structure. Interviewer: Right, that makes a lot of sense. I wonder if you have any thoughts about the relationship between U. Va.’s disabled community and Charlottesville’s disabled community more broadly? Do you see any gaps, divides? Mark: I don’t think that’s something we have really considered. I think that the greatest extent to which we’ve seen an interaction between students and outsiders is just something with the Lawn ramps, where it’s a situation that obviously effects or benefits students with disabilities, but it will also benefit elderly people or people who will come and have strollers, and sort of situations in which renovating a building or a structure that particularly helps individuals with disabilities also just has benefits for people at large. But beyond that, I don’t think we have really explored that connection. Andi: I, through another one of my classes, have looked into the relationship between the Charlottesville community and the University in general, not necessarily the relationship between the disabled communities. But, I also don’t think that our demographic reflects the Charlottesville community demographics, at all. 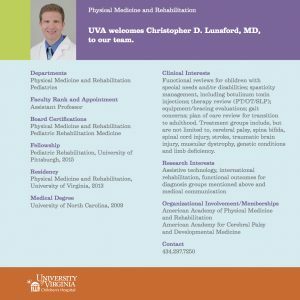 I think that U. Va. has a lot fewer disabled students then the Charlottesville community has because this is a hard place for someone to get around and to feel welcome [from an architectural perspective]. And so, I just think that fewer students who are physically disabled would consider coming here, thus lowering our demographic [diversity]. Mark: I think statistically, it’s like 10% of the U.S. population has a disability, and 8% of college students, but only 5% of U. Va. students have a disability; but that includes learning disabilities and a broad range [of other disabilities]. 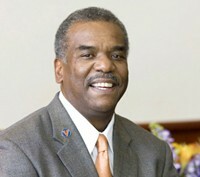 Andi: But that also reflects in U. Va.’s having a hard time with race and socioeconomic status. Interviewer: Just based on your personal perceptions, would you say that the U. Va. community is more homogeneous than the Charlottesville community. Michelle: It depends on what particular neighborhood you’re in. Interviewer: Yeah, I guess that’s true. If you go on the edges of Charlottesville, it’s a lot different than if you go closer to the University. Ok. One more line of questioning—and we have already talked about this a little bit. Could you each say something more broadly about your experience as able-bodied people working with disabled people? Has this been a difficult thing to navigate? Has there been something you have learned about yourselves from interacting with a community whose needs are different than your own? Andi: I actually receive accommodations—I have a series of unique learning disorders and I don’t often share that, I don’t often publicize that very often—but I guess, for me, I don’t really view it as an “us and them” sort of thing. For me, I guess I did learn a lot more about myself because I have a new perspective on my own accommodations, and how small they seem compared to these accommodations that we are looking at on a bigger, broader level. What was the second part of your question? Andi: Yeah, right! But also, I have learned that because it’s not an “us and them” situation, you don’t need to feel awkward about being naive, because people are so willing to explain something to you, especially if it controls so much of their life. And I found that everyone has welcomed me with open arms, and shared so many interesting and personal things that I would never [necessarily] expect them to share with me. That’s what makes it not “us and them,” because, they’re just so willing to be supportive and open about the struggles they [disabled people] have. Tori: There’s so much to do to be more aware of the disability community here, besides just the physical [barriers], or the extra work that must be done, like remembering to ask first if they [clubs] will need accommodations before planning events. Mark: Yeah, I just will echo what Andi was saying: these aren’t necessarily conversations that we need to shy away from and that maybe the first time you interact with someone, you might offend them, but as long as you are aware of your privileges, and that you learn from your mistakes—you know, if you continue to dance around this issue and never address it, it’s never going to get solved. And going into a situation where you understand it affects other people, and then become more aware, better understand the issue at hand, then that enables you to be a better ally in the future. Interviewer: So, it’s a certain level of being self-aware of your own ignorance? Interviewer: Anything you [Michelle] would like to add? Michelle: Last year I was interning with a professor who was working on an accessibility app, and because she had struggled with typing—I am also a terrible typer, and I can’t spell anything—we made an interesting team. But, we were both able to complement each other, because she had certain skills that I didn’t have, but I think it was nice just to show we each had our own values and things that we weren’t able to do. And to work in that manner, getting to know someone on the personal level and build a friendship, I think helps dispel a lot of misconceptions that people might have [with being an ally to the disabled/minority community]. I think the more you befriend and remain open to anybody and allow them to access spaces that you’re in, or go to spaces that might be more accessible, that helps to broaden your mind and make you more considerate about the world. Mark: I would add too, that [disabled] people aren’t really asking for sympathy, they’re just asking to have access to the same opportunities that anyone else has. You don’t necessarily need to treat them with “kid gloves,” you can have these open conversations and figure out what the best solution for everyone is so that they can have the same access to the resources that everyone else has. Last week I was walking downtown to see a couple of former students read at a local bookstore. The day was sunny, and warm – pleasant in that abstracting way that draws one inward. I wasn’t paying attention to the man when he first shouted at me from his car, though I heard him, dully. “Excuse me?” he almost pleaded, and I just knew that he was speaking to someone else. I kept going. Then I heard the hollow click of a car door opening and to my left I saw a tall, thin man rounding the front of his parked SUV. “Excuse me, sir?” he said again, and I stopped, thinking he needed directions. Which way to Monticello? Which way to the Rotunda? I smiled at him. “I have something to give you,” he panted, with his hand extended out to me. Oh, no, I thought. I wasn’t confused or alarmed: disability is a very public thing, and in thirty-one years I have been stopped by strangers more often than I can remember. They usually want to know that their sons or daughters will not soon die; they want to know my secret. Or they want to share, to witness, to offer good news to me. They want me to be saved. Or, more rarely, they want to give me money. I’m not sure why, exactly. You don’t have to give me anything, I said to the man, not looking down at his hand, which would have implied a kind of consent. “I know I don’t have to give you anything,” he whispered. “I want to.” When I didn’t say anything, he slipped a folded bill into my shirt pocket and climbed back into his car. When I got to the bookstore and checked my pocket, I found a hundred dollar bill. I haven’t yet spent it. As I said earlier, this was not the first time I have been stopped in the street by a stranger. Once, in New York, a man hurriedly crossed the street beside me. That is a nice wheelchair you got there, he panted. It wasn’t all that nice, the wheelchair, but I didn’t argue. I didn’t say anything, in fact. My silence suggested he try another way to reach me. “Yo man, what’s the best nation in the world,” he asked, now on the other sidewalk. I, uh, don’t know, I stammered, kind of stunned by this question. “A donation!” he crowed, clearly pleased with himself, that clever pun. I don’t have any money on me, I said, and some light fell out of his face. He was disappointed: not that I would not be giving him anything, but that I didn’t understand what he wanted. It is true: I didn’t understand. He smiled sadly and turned back to cross again. The night was cold and dark and I had failed to console him. Some years later, in Carrollton, Georgia, on the first day of December, the day was warm enough to sit outside. I was eating turtle soup for the first time. And the last, as I recall the muddy grit of meat in the dark broth. This moment was certainly before the curious advent of social media: I didn’t tweet about it, or post a filtered snapshot of my meal to the world. I was sitting there, thinking about the rest of the day and the untidy stack of papers that waited to be graded when I returned home. I wasn’t thinking about my body. How it had been broken a long time ago and yet was still there. I was thinking about what it meant to be eating turtle in the winter when a white-haired man stopped on the sidewalk. He was a lawyer, he said, in the office above the restaurant and wanted to know what I did. I never volunteer that I’m a poet; I say that I teach English. “That was my favorite subject in school,” he beamed. He loved Faulkner. He loved O’Connor. He asked if he could sit at the table with me and I said yes. “What happened to you,” he asked, his voice soft as a bruise. He looked away towards the town square and all the people out on their lunch breaks. I told him: how I broke my neck in a bicycle accident at age twelve. That it had been, at that point, twenty years. The man seemed to vibrate with sadness. He was sick with some sort of grief. I am so sorry, I said. He was quiet for another moment. He put his hands on the table as he stood up. And that was it. I saw him once more in my time in Carrollton. At a distance across the square as he climbed into a truck and drove away. I don’t think he saw me. To this day, I wonder about his son. If he got better. If he lived. I think about that father and the beat-up truck he drove like a symbol of another life.